As a software developed for centralizing and managing time attendance data, TCMS V2 boasts powerful features that can be used for automating time attendance tracking. One of these features is to configure the software to automatically send specific reports, such as sending electronic time cards of all employees to every manager on the first of every month. These reports will be delivered as emails via an SMTP email server. Before proceeding with the following steps, you will need to download the patch file, TCMSV2ReportSchedular, and save it into the TCMSv2 folder. Go to System Settings > Report Scheduler > Click Add Report > Select the report that will be sent out automatically. 1. Click on File and select the format for the report, for example, PDF. 2. Filter the reports by Group, Department, Section or an individual's Employee ID. 3. Click on Email to configure your recipients’ email addresses and SMTP server settings. Every: Send the report either on weekdays or on a specific day of the month, for example, the first of every month. Run Time: Set the time for the software to start generating and sending in the reports. Before the time starts, make sure that all records from the connected devices have already been downloaded. This is to confirm that all reports are fully complete with attendance records. 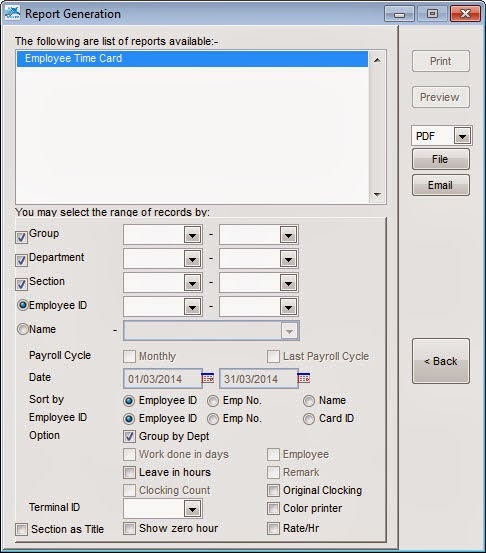 Data: Set the range of attendance records to send, for example, Current payroll cycle. Start Run: Determine the starting date to apply the automatic sending process. Enable: Activate the automatic sending process by ticking the box. This feature offers a more systematic approach to generating and sending reports to relevant employees. Selected reports can be scheduled to automatically send on appropriate dates, saving the company time and effort and allowing the extra time to be utilized on other issues. it can't seem to send an email to a recipient....after setting up the SMTP details. "Print Job fail"
Regarding on your inquiry. I'm already reply on your previous email. Can't find Report Scheduler under system setting...shall I just copy the TCMSV2ReportSchedular.ZIP into the folder, unzip it? or click on the EXE file? First of all extract the TCMSv2 Report Schedular.ZIP. Then copy the file and paste into TCMSv2 folder. For information there is 2 file named 'rptsche' and 'RptService'. Once completed, open your TCMSv2 software. You will find the Report Scheduler function under System Option. Thanks. For Temporary, please select report format as PDF instead of XLS Data. Our programmer in the middle of checking the XLS Data "Print Job Fail" issue. Hi, My reports ie. "Electronic time card" are printing in two pages. The Reports came formated for Letter by default. We use A4. Is not possible to configure the paper format by default with the printer options configuration instead of a preconfigured format (letter)? Kindly update and email to us if your problem still not resolve at support@fingertec.com. Thanks. but the problem is happening with "Sending Reports Automatically" when executing by the scheduler . Hi, Can you provide the details problem together with the screen shoot picture and send to support@fingertec.com for further checking. Thanks. Hi i am using FingerTec TCMS v2.2.025 and i downloaded the zip file and extracted and then copied in the TCm folder. I am still not getting Report Scheduler in System Setting. Any Help will be grateful. Please kindly copy the files only without the folder into TCMSv2 Folder. Please let us know if it works. Hey i got it but how do i set the email to which the reports are sent to. Kindly provide us the details of your query. For information these features will configure the software to automatically send specific reports, such as sending electronic time cards to any employee or manager via email. Yeah. That is a big one, especially to blog owners. Hello, I am using TCMS v2.2.027 The report work successfully when I run the report manually but it doesn't work on the schedule. after checking RptService log file i found the following error : 12/06/2015, 12:34:43 StartServiceCtrlDispatcher failed, error code = 1063 . May I know, what is the current TCMSv2 Software version? You can check by clicking System settings > What's new in this release. At the same time. I have tested TCMSv2 Software version v2.2.027 16-10-2015 , found report scheduler working follow the schedule. pls i cant generate reports on my fingertec tcmv2 it gives me an error message :"invalide memeory file "
Please send your whole TCMSv2 folder to support@fingertec.com for checking purpose. Can we know which report that you referring to? Appreciate if you can printscreen the report and also the symbols that you wish to change to support@fingertec.com; so we can assist you better. TCMS V2 System since a last week the system cannot download data from terminal automatically every day. We need to download the data from terminal manually. before that the system is download the data automatically we no need to do anything but since last week cannot ready. can show me how to set back automatically download data from terminal. Actually i did this before but still not download automatically. If there is any other information required, do let me know so I may assist you accordingly. We recently used fingertec TCMS v2 at our office. The first month the attendance records showed precisely. But now we are in the second month, and even though everyone has scanned daily the attendence report still shows absent. It's like the scanner didnt save any of the scans. I HAVE SETUP SCHEDULER ON TCMS V3 . HOWEVER I WANT TO RECEIVE REPORTS EVERY MONTH. IF I SET THE OPTION OF EVERY 31 WILL IT ONLY SEND ME THE REPORTS ON THE MONTHS THAT HAVE 31. OR IF I SET IT AS 30 , WILL IT ONLY SEND ME THE REPORTS ON THE MONTHS THAT ONLY HAVE 30 IN THEM . OR IS THE EVERY 30 OR 31 JUST A LAYOUT FORMAT TO SEND IN ? ALL I WANT IS FOR TCMS TO SEND ME EVERY MONTH REGARDING IT EITHER BEING 30 OR 31 THE TARDINESS REPORT FOR CURRENT MONTH. For your info and regarding to your query, I have replied it through your email alielboussi@gmail.com. Kindly please check and update us if you still got any query. Regards. We used Fingertec TCMS V2.2.022 in our office. I've made a schedule on Report Scheduler, but it doesn't send automatic report to our email on that time we made. And i can't send report on XLS data, it always show "Command contains unrecognized phrase/keyword" everytime i try to send manually through run button. Do you have microsoft outlook installed on your comluter ? Tcms v2/3 require you to have outlook on your computer for the automatic email report schedule to work . Are you sure it's necessary ? How to sync outlook and fingertec to make it send automatically ? Can we just used email form on Report Options of Report Scheduler ? Because we can set both 'from and to' email can be sent on it. Referring to the problem, upgrade your TCMSv2 software with the latest version (v2.2.027) by refer to the following step. Before that, please backup your database file at System Setting > backup/Restore database > select Backup. Once finished, you can try to run the Report Scheduler and check the status. Regards. Thank you for solution. I've installed TCMS V2.2.027 and report now can be sent with XLS format. But it still can't send automatically through email. Any solution for this problem ? With regards to your query, you need to make sure the services already running in order to make sure that the report scheduling can run smoothly. After paste the 2 files to TCMSv2 folder, you need to run the file as admin. After that, you can monitor whether that services already running on the background or not. when i print report in app fingertec , make problem " toolbar not found " and "print not load"
With regards to your query, please close the TCMS V2 software and delete all .CDX files inside TCMS V2 folder. After that, kindly check if the any other error on the software. If the software still has an error, please send an email to support@fingertec.com and explain the details of the error.